Ayutthaya has a large Muslim-Thai community that traces its roots to the Persian, Arabian, Turkish, Malay and Cham traders who made their homes here over the centuries. While there’s no museum to match the ones found at the former sites of the Portuguese, Dutch and Japanese settlements, you can take a wander through a picturesque Muslim Quarter where the history comes alive. Known locally by the blanket-term Khaek, Muslims played important roles in lucrative trade routes from Ayutthaya to India, Persia, Arabia and back through the East Indies and Malaya. Many permanent Muslim residents made their livings by producing strong ropes for ships or selling the jewels and fabrics that were imported from India and the Middle East. Clustered along the southern bank of the Chao Phraya, a modern Muslim village is home to men in traditional white kufi hats and women donning the hijab. You’ll find a few mosques established centuries ago, though none that have preserved their original structures. Perhaps more intriguing are the narrow lanes lined by modest houses where families cook up Muslim-Thai food. The Muslim neighbourhood next to Wat Phutthaisawan seems to have been set aside as the “Muslim Quarter”, but in fact there are several predominantly Muslim neighbourhoods found in Ayutthaya. Located along the both banks of the Chao Phraya as it churns down into Ayutthaya to the northwest of town, the large Nurun Imanwaritsunna Mosque is one of the more impressive. Marked by a large yellow dome on the grounds of Rajabhat University towards the south side of the island is the tomb of Sheikh Ahmad Qomi, a prominent Persian resident of Ayutthaya in the 17th century. Many local Muslims sell roti sai mai (sugary threads wrapped in unleavened bread) on nearby Uthong Road, which might as well be called “Roti Road” along this stretch. 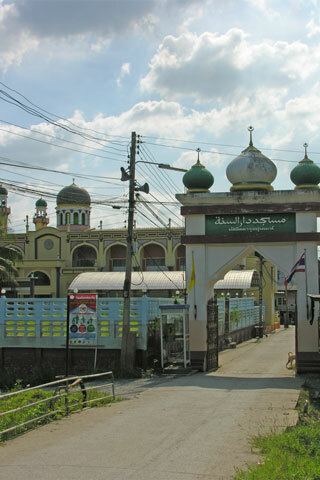 A Muslim Quarter is located off Route 3469 along the south bank of the Chao Phraya River, just east of Wat Phutthaisawan and in the vicinity of Aliyinnuroi Mosque.